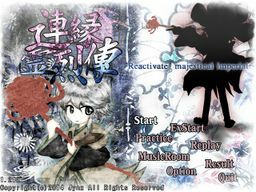 Len'en Reiretsuden (Connecting Chain of Raging Spirit Tales) ~ Reactivate Majestical Imperial (連縁霊烈傳　～ Reactivate majestical imperial) is a vertical-scrolling danmaku shoot 'em up and the third game of the Len'en Project. It was made by Trick Nostalgie's sole member JynX and released for the Windows operating system. The first trial version of the game was sold at Winter Comiket 2013, and the updated public trial version was released on 19 March 2014. The full version of the game was released on 2 October 2014 as a free download. Like previous Len'en Project games, the title consist mainly of five Japanese kanji, plus an English sub-title that relates to the main title without necessarily being a translation. In the title, "Reiretsuden (霊烈傳)" is referencing the amount of spirits that are coming to Mugenri in the game's plot. "Reactivate Majestical Imperial" refers to the resurrection ceremony of Taira no Masakado, a ritual held by Taira no Fumikado to become the new emperor of the capital. The Japanese title was originally "鏈縁霊烈傳", but it was changed to "連縁霊烈傳" in v1.10 in accordance with Brilliant Pagoda or Haze Castle. Unlike previous games, "Reactivate Majestical Imperial" is officially written in lower-case. The game features several new gameplay mechanics. The player can switch between the two members of their chosen team, each of whom has their own attacks, bombs, play style and even power gauge. Team members switch out by activating a bomb or by getting hit by an enemy bullet. The team member that is not currently active is shown at the bottom edge of the screen, and moves to follow the active member. The inactive member can collect power items that fall to the bottom of the screen, as well as ghost items (which can only be collected through this method). Ghost items fill the "Spirit Jar" on the right side of the screen, which provides the player with a brief power-up for a limited time when filled, this power-up varies from team to team. The game features original tracks composed by JynX that mimics ZUN 's style. Similar to the Touhou Project games, the music room doesn't show the names of all the themes from the first time playing and thus requires to select one theme twice if the player wants to listen to the track. There may be a few melodies in most of the tracks that strongly resembles those from the Touhou Project. The first trial version of the game was sold at Comiket 85 with JynX's Touhou arrangement album 現樂団の往古 ～ 束方廻怪綺談 ～ . A second trial, v0.05a, was released freely to the web on 19 March 2014. The full version of the game was released on 2 October 2014 as a free download. On 14 October 2017, v1.10a of the game was released. This update opened the game's text and image resources to allow for easier translation. It also introduced Suzumi Kuzu as an unlockable fourth player character team. On 2 June 2018, the game was further given a new "Light Level" mode. The game was also updated to fix scoring on 9 October 2018, taking it to v1.21a. This page was last edited on 2 December 2018, at 14:58.